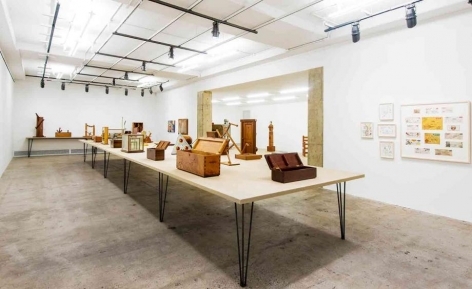 “Homage to American Art (Dedicated to Elie Nadelman)” is one of 38 sculptures in “See America First,” a terrific exhibition of works by the great American visionary H. C. Westermann (1922–1981) at Venus (formerly Venus Over Manhattan). From a wooden hook attached to a post anchored to a neatly dovetailed wooden pedestal hangs an object with the handle and shaft of a shovel but, instead of a conventional blade, a wooden sphere the size of a bowling ball. It’s hard to imagine what sort of useful work could be done with this curious tool, made in 1966. Mr. Westermann once said that he wanted his constructions to look as if they’d been made by a mad cabinetmaker. He wasn’t crazy, but he took seriously ideas that arose from the deeper, less rational precincts of his mind, and he ushered his intuitions into physical being with consummate craftsmanship. Tools and their proper uses were important for him, as they are for most woodworkers. To do his thing, however, he needed certain less orthodox implements as well, like the one cradled in an oblong box in a piece called “I’m Goin’ Home on the Midnight Train,” from 1974: a hammer with a steel head at either end of a lovingly carved handle. It wouldn’t be useful for an ordinary carpenter. But think of it this way: One end might be for pounding regular nails, the other for nailing down fleeting ideas. The practical and the poetic, yin and yang. The exhibition’s title, “See America First,” is taken from three similarly titled cartoon drawings from 1968 inspired by a cross-country road trip that Mr. Westermann and his wife took in 1964. The show includes a selection of exuberantly illustrated letters he sent from different points on their journey to Allan Frumkin, his dealer, and to Mr. Frumkin’s young sons. Long before that, “See America First” was the slogan of a campaign by tourism boosters early in the 20th century. Appropriated by Mr. Westermann at a time when the United States was pursuing a doomed war in Southeast Asia, while roiled by social and political dissent at home, the title took on a different, soul-searching urgency, a sense of moral purpose that animated much of what he made. Death was often on his mind. While serving as a United States Marine on the aircraft carrier Enterprise in the Pacific during World War II, he weathered kamikaze attacks by Japanese fighter planes. He did a tour of duty in the Korean War, too. As they did Joseph Heller, author of the great absurdist war novel “Catch 22,” experiences of combat evidently left Mr. Westermann with an abiding sense of human irrationality and existential insecurity, which he expressed with darkly comic élan in his art. As a student attending the School of the Art Institute of Chicago on the G.I. Bill in the early 1950s, Mr. Westermann concentrated on painting. Two delightful examples from 1953 combine finely patterned geometric abstraction and surrealistic images, like that of a funny, human-headed quadruped. Paul Klee was certainly an influence. After leaving school, Mr. Westermann focused on sculpture, which brought out the full range of his idiosyncratic sensibility. His constructions from the mid-1950s on are as philosophically provocative as they are funny. 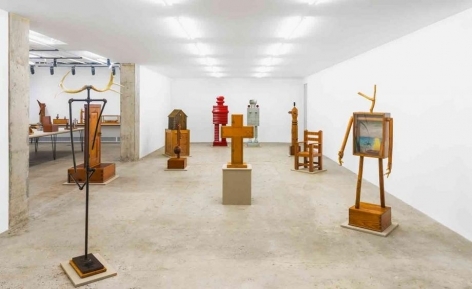 “A Human Condition” (1964) is a three-foot-tall pine box in the shape of a cross. Its front side presents a cruciform door with a knob on the right arm and brass hinges to the left. You’d like to open it, but if you tried, you’d be frustrated: One hinge is screwed to the end of the cross’s arm, and two others to the vertical parts, making it physically impossible to open. What, if anything, lies within — the heart of darkness? Death? — remains a mystery. A recurrent motif is the “death ship.” “Untitled (Walnut Death Ship in a Chestnut Box),” from 1974, alludes to Mr. Westermann’s kamikaze experience. A minimalist model of a modern ship’s hull is contained in a box whose lid has an airplane crashed into one end and a black, cross-shaped grave marker at the other. In a version from 1966, “Death Ship Runover by a ’66 Lincoln Continental,” a ship model has black tire treads wrapping around it, and it floats on a sea made of dollar bills punctuated by a black shark’s fin, all within a wood-framed glass display box. It’s a mordant meditation on capitalist imperialism and mindless consumerism. The death ship also turns up in many of his drawings and prints in settings reminiscent of those in Joseph Conrad’s tales of woe and tragedy on the fringes of European empire. It appears in two of the seven beautiful woodcut prints making up a suite called “Connecticut Ballroom” (1976). In “Arctic Death Ship,” it’s sinking in an icy sea, and it looms in the background in “The Dance of Death (San Pedro),” wherein a man in a tuxedo, resembling Mr. Westermann as well as Clark Gable, waltzes with a skinny woman on the dock of a desolate, rat-infested seaport. An expansive spiritual generosity animates all of Mr. Westermann’s works, even the darkest and most fiercely satirical. His art was a gift to the world, and it’s still giving. “See America First” continues through Dec. 19 at Venus, 980 Madison Avenue; 212-980-0700, venusovermanhattan­.com.